We’d been a long day on the road and running late, hurrying now that a sunset was setting the sky on fire, worried we’d find all the campsites taken. 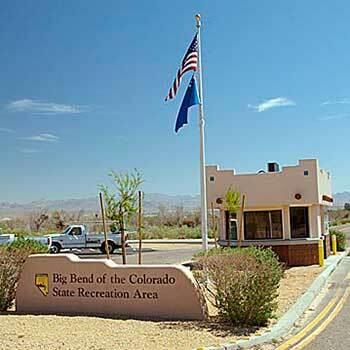 We’d visited the Big Bend of the Colorado Recreation Area a few years ago and remembered it as an attractive spot with 24 campsites. There were only embers glowing in the western sky when we pulled off the Needles Highway about five miles south of Laughlin. But . 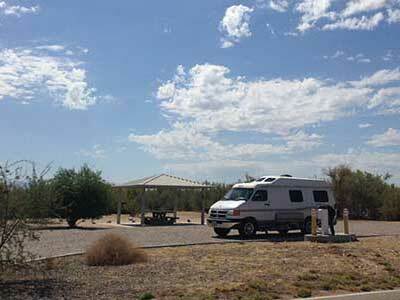 . . other than a single RV near the entrance the campground was deserted. We drove slowly past 23 empty camp sites, one after another, then came back around to pick one near the showers and hook up to the power. We drifted off to dreamland wondering why we were the only ones using this very nicely designed and maintained — and eerily empty and silent — facility. Goldfield Days is shaping up to be something different this year. It’s the weekend of August 17-19, and Goldfield is the place to be. Goldfield Days, third weekend in August, is the little city’s annual celebration of itself, and it’s always a dandy. One time a lady took her clothes off in front of everybody, this time they’re going to burn a bus. I’m packing for the trip, see you there. The Kingston Jubilee was held on the large, green lawn of the Miles End bed and breakfast Inn, an attractive retreat in the middle of town. At the Freakers Ball on Saturday night local residents and ranchers boogied alongside out-of-towners and Burners. Many in the crowd turned out in costume. Glamorous women swooped by in flowing dresses and pink, blue, or green hair. Men sported Stetsons and top hats. One guy was boogying in a terrycloth bathrobe. 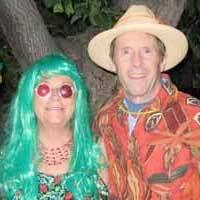 A Kingston couple came as cave man and cave woman, wearing furs and carrying clubs. In consideration of the neighbors, the band stopped playing at 11 pm, but most of the crowd stayed later, extending the lovely evening late into the night. In the morning it was just us and some roadrunners zipping around. The temperature began to rise before the sun did. And then the sun burned its way slowly across the cloudless sky above the shadeless park for the rest of the day, thus providing the answer to last night’s wondering: it’s too [expletive] hot! Not just hot, you understand, but too [expletive] hot. barbecues are all in use. Fishermen are fishing, hikers are hiking and the boat ramp is bustling with small pleasure craft loading and unloading into the river. These trails and beaches provide pleasant and relaxing enjoyments of the natural world along the river, and if that’s not enough, Laughlin is just upstream. 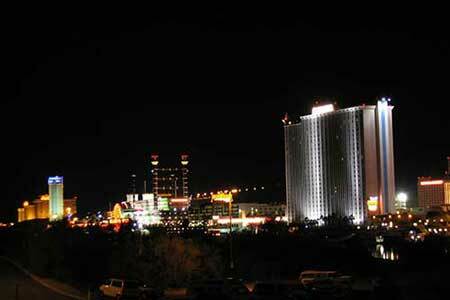 There is a residential Laughlin higher up the hillside, with a grocery store, insurance agents and all the clutter of modern life, but it’s the Casino and Entertainment district along the river that visitors flock to. It’s a row of nine glowing gambling houses large and small (mostly large) with thousands of hotel rooms, dozens of bars and restaurants, a 7-fingered handful of lounge and cabaret stages, and a large outdoor concert venue. This is Las Vegas in the slow lane. A decorous amount of razzamatazz, no traffic jams and plenty of free parking. And there is the RiverWalk. This is a quirky 2-part 3-mile trail along the river that is fun to walk. 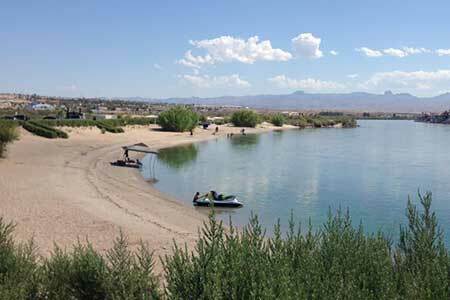 Its southern end is at the Laughlin River Lodge, and the first part goes north from there. It passes behind, through and around the great casinos that invite lingering along the way: have a drink, have a snack, play a little blackjack. Robin and I interrupted our stroll with an excellent breakfast and an idyllic view of the river at Bumbleberry Flats in the Golden Nugget. The first part of the RiverWalk ends at the pedestrian bridge over the highway coming into town from the west. Crossing the bridge begins the second part of the walk, an easy mile and a half farther north on the nearly level ground beside the river. This is Mom Nature in the desert without her lipstick, quite different from the backsides and insides of the casinos on the first part of the walk. Bring your tackle and you can fish for bass and trout from the shaded pods installed along the shore for the purpose. The walk ends at Davis Dam at a day use area with shaded picnic tables and barbecues plus a big lawn and a splash pad for kids. We noticed something strange in Tonopah. Advertised gasoline prices were as much as 60¢ higher at the edges of town ($2.89) than at Valero and Giggle Springs in the shadow of the Mizpah ($2.29). When I inquired I was given a nonsequiterial response, which I did not pursue. 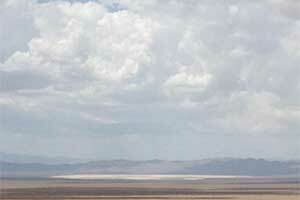 But if you’ll be driving in Tonopah, keep it in mind. Anyone who remembers Carol’s Country Kitchen in Austin will be thrilled to learn that Sissie Gallegos and Cindy Jolly are preparing to open a restaurant in the Main Street Shops in Austin. Sissie is an Austin native who worked for Carol, when her steak dinners were famous in five counties, and she worked at Carver’s in Big Smoky Valley too. No opening date has been firmly established, but it will be called Grandma’s and will be a grand addition to Austin’s culinary attractions. 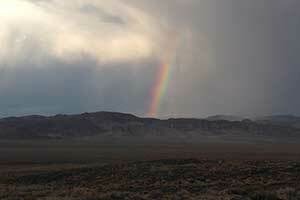 Our drive up US 95 was especially dramatic, as Mom Nature was showing off her chops, one riff after another. Black patches on the mountains were the shadows cast by fluffy white clouds. Dust dervishes danced madly across playas. 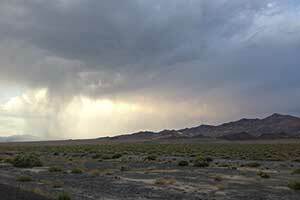 Virga fell from black clouds halfway to the ground. We made our traditional stop at S’socorro’s in Mina for chocolate malts. It’s not easy to think of Mina as bigger than Hawthorne, but it was when the Carson & Colorado railroad tracks were realigned around on the east side of Walker Lake and bypassed Hawthorne completely. Mina boomed with th railroad and Hawthorne sagged without it. But when Hawthorne got the ammunition depot it got the railroad back too, and recovered its health. Doc Sherman earned his place in the Nevada Hall of Fame in the mid-1990s when he filled some gloves with urethane foam, stuck them on top of fenceposts alongside the road leading up to Great Basin National Park, and proclaimed them the emblems of the Permanent Wave Society. 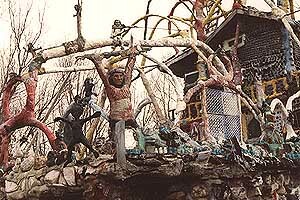 That endless gesture of greeting inspired others who added more whimsies and ecstatic chimera at the side of the road — a ramshackle jalopy was outfitted with the skeleton of a horse in the driver’s seat and the assemblage was christened The Horse With No Name. This self-curated exhibit of “Post-Impressionist” art by local residents became an attraction in its own right, ornaments put in place by benign spirits who live hereabouts. 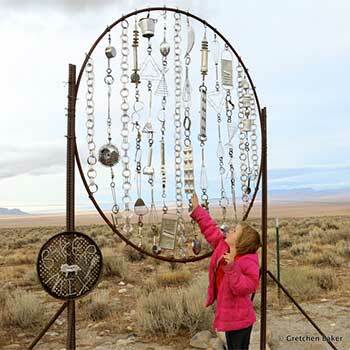 So intriguing were these new pieces — so successful as art, in other words — that drivers paused in the roadway to look at them and take photos, causing enough disgruntlement amongst other drivers that one of them called the Highway Department to complain. Safety is certainly a legitimate concern, but to scoop up these delightful works and haul them away without warning? Why? It wouldn’t have taken a detective to find the authors of these pieces before they were grabbed and put into quarantine. The Nevada Travel Network has outdone itself, and I am beaming with pride and pleasure when I report that in September, while booking rooms by the dozens for human travelers, we also booked our first stalls for horses. Within the daily torrent of e-mail requests for information came one from a traveler driving east from California to Wyoming (or was it Montana? — one of those eastern states, anyhow) wanting a place to board her horses overnight in Wendover. A flurry of e-mails across northeastern Nevada brought a response from the City of West Wendover with directions to the City Corral, where the equines passed a peaceful night and their chauffeur went out and had some fun. And speaking of Wendover, it’s the hottest place in Nevada just now and we are not talking temperature here. Officially West Wendover, it has grown to be a bright spot in northeast Nevada and a major contributor of jobs and tax revenues in Elko County. 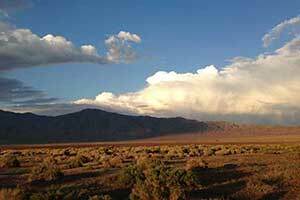 Wendover Utah, meanwhile, grew by providing low-rent housing for the low-pay employees at the Nevada-side casinos. The Nevada city had actually begun the process of absorbing its rickety Utah neighbor, and bureaucrats on both sides were scratching their heads over how to redraw the state boundary line when the bankruptcy of the Silver Smith and State Line casino hotels, put everything else in the shade. 1. Build pull-offs to view the art; offset the cost via a Crowdfunding solution. 2. Send Assistant District Engineers to Charm school and oblige them to get to know their neighbors. In February a public meeting was convened on the topic in Baker, with about 20 locals in attendance, an unprecedented turnout, along with the NDOT brass and White Pine County Commissioner Gary Perea. NDOT Director Rudy Malfabon agreed the agency will now work directly with the Baker Area Citizens Advisory Board, which will serve as the permittee and point of contact for the local artists. He also spelled out NDOT’s requirements for putting the art back. So far though, no appropriate location has been established to display the sculptures and no permit applications have been made. For the time being at least, Baker’s blithe spirits have been subdued, filling out a permission form is chloroform to sublime silliness. 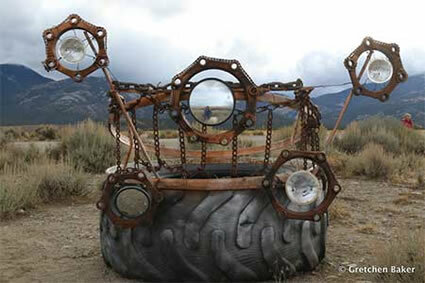 The sculptures remain under lock and key and a slight pall has fallen over Highway 188. Still, NDOT has opened a channel to put the art back beside the road, in a carefully prepared location of its own choosing. So how about a crowd-funded effort to pay for it? Wouldn’t pitching in to cover the cost of building the pull-off be a big boost toward getting it done? I’m in for $100. Visitors are invited for light refreshments at the Western Folklife Center Open House during the Elko Wine Walk on Saturday, September 9, from 4 – 6 pm. Internationally acclaimed ceramists Dennis Parks and son Ben Parks of Tuscarora will talk about the exhibit “Dennis Parks: Land, Language and Clay”. Also, former Center E.D. Charlie Seemann will celebrate his new book and companion exhibition, “Way Out West: Images of the American Ranch, Photographs From the Farm Security Administration, 1936-1943”. Both Seemann and Parks will sign their books, available in the Gift Shop. The exhibitions will be free and the Pioneer Bar will be open. McAvoy Layne has entertained audiences around the world as “The Ghost of Twain”. 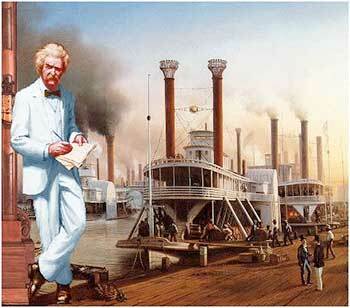 In November he will host Mark Twain’s 183d Birthday party aboard the Mississippi paddlewheeler “America” as it churns upriver from New Orleans to Memphis after a pre-departure party the night before. McAvoy will be telling stories and reliving “Life on the Mississippi” to share Twain’s observations in private gatherings over the course of the journey. “America” is one of the finest river boats ever built, with many novel features, a casual ambiance and panoramic views of the passing scenery. 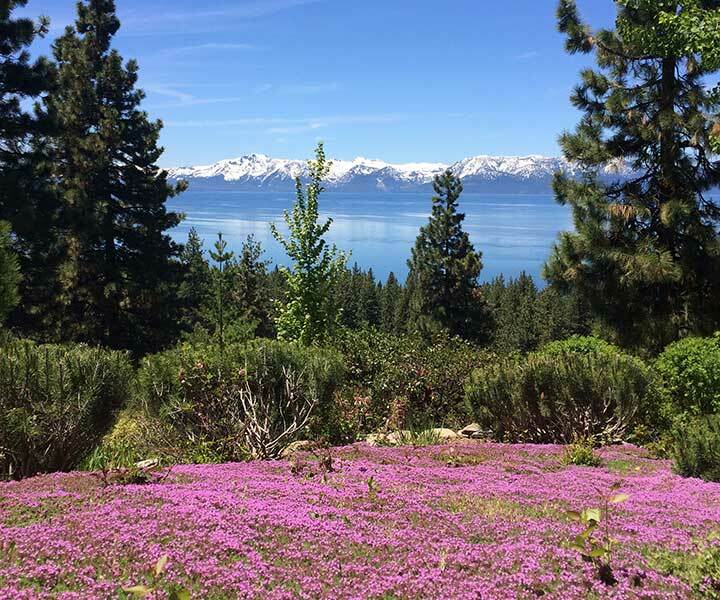 Occupancy is limited 185 guests, and to book your place for the November 9-17 cruise you can call McAvoy at 775-833-1835 or visit the website. I’m in for another hunski. Keep your loyal readers posted on the Baker flap! It’s not like Gannett will ever let us know. 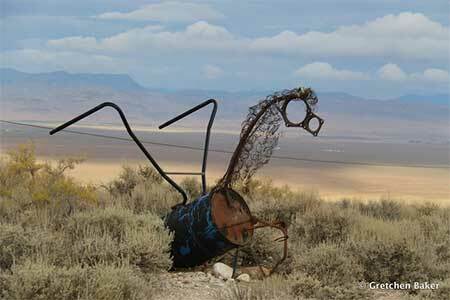 Were these sculptures places along Highway 50, The Loneliest Highway in America? So who was endangered? enjoy a laugh. We need more art and more independent people! 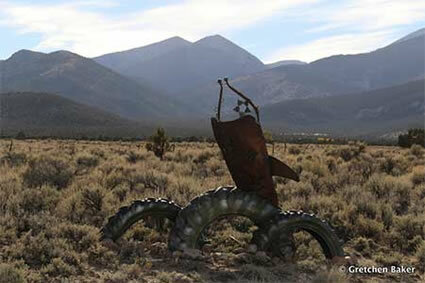 They were alongside Nevada 188, the road up from Baker to the National Park.